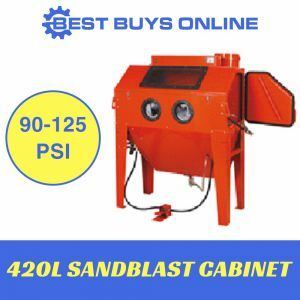 The 420L Sand Blaster is ideal for industrial usage, with high abrasive flow and high efficiency. It is used to remove scale or heavy rust from automotive parts, clean up rusty tools, etch glass, or any other special application. 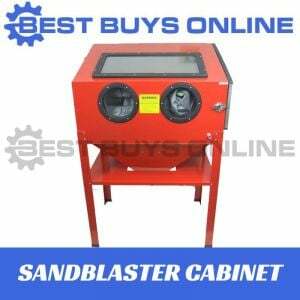 The SBC 420 sandblast cabinet features dual side doors and a large front door for easy loading and unloading. It has excellent lighting and a very powerful vacuum system. The lower hopper stores the abrasive material for use and reuse and opens easily to allow easy removal of any media. The SBC420 uses a foot pedal to control the speed and flow of abrasives from the air gun. 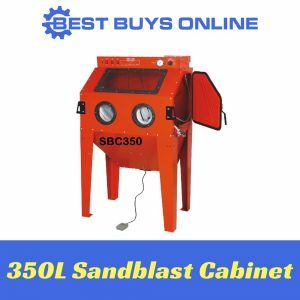 The foot pedal allows the operator to just “hold and point” the gun rather than the need to “pull the trigger” of the sandblast gun which can be very tiresome. Shipping Size : 143 kgs & 125 x 127 x 76cm.